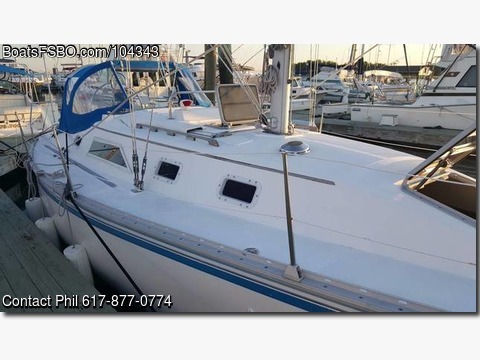 Boat is located in Winthrop,MA.Please contact the owner @ 617-877-0774.. Okay, who's ready for a really good deal on a very well maintained sailboat My Hunter has been on the market for a little while. Why you ask Because silly me, she had a few interior cosmetic issues that I hadn't gotten around to fixing because, well, I think maintenance and safety should come first. All fixed now If you are in the market for a great sailing, well maintained, fun to sail, roomy boat then you owe yourself a look at this one In the water, rigged and ready to sail. Spend the 4th of July on your new boat With the deep keel 5-12 draft she is stable, loves to reach and points very well. This era Hunter 83-87 was really the beginning of the well equipped and roomy cruiser for the casual weekend sailor. The previous owner had the Yanmar 2GM20F Diesel installed brand new in 2005. The engine has very low hours. Mainsail with Lazy Jacks and Doyle Stack Pack, 2 Jibs and a Spinnaker I've never used. This is a great boat to move up to if you want to go bigger without breaking the bank. 2008 New portholes, Factory compass rebuild. 2009 New side windows, Doyle Stack Pack, 3010C Garmin GPS Chartplotter. 2010 New SS shaft with dripless. 2011 New Galley Faucet. 2012 New Dodger. 2013 New Furler. 2016 2 new batteries, bank 2, New Compression Post, New Mixing Elbow on Yanmar. 2017 2 new batteries bank 1, New Racor, New Macerator, New Sink and Faucet in the Head. Engine gets an oil change at the beginning and end of every season along with new filters in Racor and on the engine. Bottom sanded and painted every year.